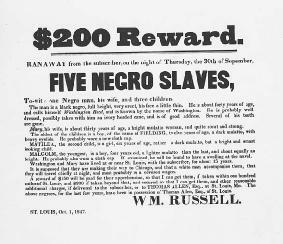 An 1847 handbill offering a reward for an escaped slave. The Supreme Court's decision in Prigg frustrated slave owners as Northern states obliged the Court by refusing to participate in fugitive slave proceedings. A pre–Civil War case, Prigg v. Pennsylvania, 41 U.S. (16 Pet.) 539, 10 L. Ed. 1060 (1842), declared unconstitutional all fugitive slave laws enacted by the states on the ground that the federal law provided the exclusive remedy for the return of runaway slaves. The national debate over Slavery grew in intensity beginning in the 1840s. Many of the Northern states demonstrated their hostility to slavery by enacting laws that attempted to frustrate Southern slave owners who came North in search of runaway slaves. Slave owners were outraged at these laws, arguing that the federal Fugitive Slave Act of 1793 gave them the right to reclaim their property without interference by state government. In 1842 the U.S. Supreme Court resolved the issue in Prigg v. Pennsylvania. Edward Prigg, a professional slave catcher, seized Margaret Morgan, a runaway slave from Maryland living in Pennsylvania. Prigg applied to a state magistrate for certificates of removal under the federal Fugitive Slave Act of 1793 and an 1826 Pennsylvania personal liberty law. Prigg needed the certificates to legally remove Morgan and her two children to Maryland. The Pennsylvania law had a higher standard of proof for demonstrating the slave owner applicant's title to the slaves. After the magistrate refused to issue the certificates, Prigg illegally returned the slaves to Maryland. Pennsylvania indicted Prigg for Kidnapping under the 1826 law and extradited him from Maryland. Following his conviction, Prigg appealed to the U.S. Supreme Court. By an 8–1 vote, the Court reversed his conviction. Writing for the Court, Justice Joseph Story concluded that the Pennsylvania law was unconstitutional because it conflicted with the federal act. He based his analysis on the Fugitive Slave Clause contained in Article IV, Section 2, of the U.S. Constitution. The clause directs the return of runaway slaves to the state from where they came. Story claimed that the clause was a "fundamental article, without the adoption of which the Union could not have been formed." His historical analysis, however, was questionable. The clause was added late in the Constitutional Convention and was not debated. Nevertheless, Story concluded that the clause was a "practical necessity." Without it, every non-slaveholding state would have been at liberty to free all runaway slaves coming within its limits. This would have "created the most bitter animosities, and engendered perpetual strife between the different states." Having established that the Fugitive Slave Clause guaranteed the rights of slave owners to reclaim runaway slaves and to prevent nonslaveholders from interfering with such property rights, Story looked to the Fugitive Slave Act of 1793 for enforcement of these rights. Story held that the constitutional provision gave Congress the authority to pass the act, stating that "where the end is required, the means are given." Pennsylvania had argued that its law was based on the police powers given to it by the Constitution. Story rejected this argument, holding that because the federal law was based on a specific constitutional provision that was national in scope, the federal power on this issue was exclusive. As an extension of this conclusion, Story ruled that states were not compelled to enforce the federal fugitive slave provisions. It would be inconsistent and without legal basis, he reasoned, for the Court to declare the preeminence of federal law and then require state courts to help carry out the law. Therefore, the federal government was "bound, through its own proper departments, legislative, judicial, or executive, as the case may require, to carry into effect all the rights and duties imposed upon it by the Constitution…." Though Story wished that state judges would execute the federal law, he understood that the federal government had no power to require them to do so. Even if there had been no federal law on runaway slaves, Story, without "the slightest hesitation," found in the Fugitive Slave Clause an implied right for a slave owner or slave owner's agent to go into any state and recapture a slave. The owner of a slave "is clothed with entire authority, in every state in the Union, to seize and recapture his slave, whenever he can do it without any breach of the peace, or any illegal violence." Story expressly recognized the police power of the states to arrest, detain, or exclude runaway slaves from their borders. States had as much right to protect themselves against the "depredations and evil example" of runaways as they did against "idlers, vagabonds, and paupers." These regulations, however, "can never be permitted to interfere with or to obstruct the just rights of the owner to reclaim his slave." The Prigg decision angered slavery opponents. Some state judges took Story's opinion to heart and refused to participate in federal fugitive slave proceedings. In 1843 Massachusetts passed an act that forbade any state official from participating in the return of a fugitive slave under the 1793 federal law. Other Northern states passed similar acts. Slave owners soon became aware that the withdrawal of state support curtailed their ability to return slaves to the South. There were not enough federal magistrates to process applications under the 1793 law. This led to the Fugitive Slave Act of 1850, which authorized the appointment of a federal commissioner in every county in the United States who could issue certificates of removal for fugitive slaves. Persons who interfered in the process were subject to criminal penalties. The 1850 act caused many runaway slaves to move to Canada. Prigg was a crucial case because it announced that slavery was a national issue that could not be disturbed by State Action. It also disclosed that the institution of slavery was woven into the Constitution. Finkelman, Paul. 1993. "Sorting Out Prigg v. Pennsylvania." Rutgers Law Journal 24 (spring). Maltz, Earl M. 2000. "Majority, Concurrence, and Dissent: Prigg v. Pennsylvania and the Structure of Supreme Court Decisionmaking." Rutgers Law Journal 31 (winter). Their effort, which examines landmark civil rights and death penalty opinions spanning from Prigg v.
The chapter pairing on narrative begins with a five-part definition of narrative, which the authors employ in analyzing the Supreme Court opinions in Prigg v.
Supreme Court justice Joseph Story, the chief architect of the 1842 Prigg v.